The previous post reported that the Census of Missouri Public Water Systems – 2016 found 2,733 public water systems in Missouri, of which 2,720 were active. This post looks at Missouri’s 2016 Annual Compliance Report of Missouri Public Drinking Water Systems. It is the most recent summary report on Missouri’s public water systems. Additional detail about specific systems can be found in reports published by the systems themselves. A public water system is one that provides water to at least 15 service connections, or to an average of at least 25 people for at least 60 days each year. Community Systems (CWS) supply water to the same population year-round. Non-Transient Non-Community Water Systems (NTNCWS) supply water to at least 25 of the same people at least 6 months per year, but not year-round. An example might be a school that has its own water system. Transient Non-Community Water Systems (TNCWS) provide water in places where people do not remain for long periods of time. Examples might include gas stations or campgrounds that have their own water systems. The amount of treatment that water must receive differs depending on the source of the water. Surface water and underground water under the direct influence of surface water are more vulnerable to contamination, so they receive more treatment. Underground water from aquifers not under the direct influence of surface water tend to contain water that is heavily filtered by the rock through which it seeps. Sometimes, the seepage is so slow that the water is old, predating most forms of modern contamination. Figure 1. Source: Missouri Department of Natural Resources, 2016. Figure 2. Source: Missouri Department of Natural Resources, 2016. 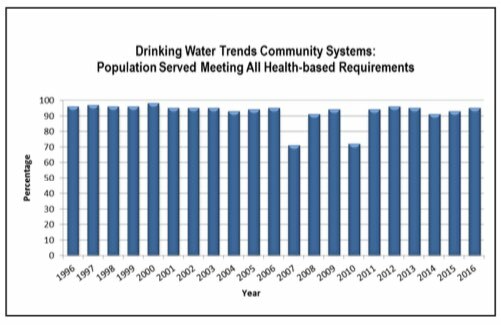 Figure 1 shows the percentage of population served by community water systems that meet all health-based requirements by year. Figure 2 shows the number of violations involving E. Coli or acute contamination levels. Non-compliance can result from many factors – from broken pipes, to human error, to systems that are inadequate in the first place. The EPA goal is for 95% of the public water systems in a state to have no health-based violations in a year. In 2016, Missouri had 94.7% compliance. That is close to the goal, but it is a decrease from over 95% in 2013. The chart shows no general trend, but in some years the compliance rate appears to slip significantly. The last 3 years have all been below the EPA goal. 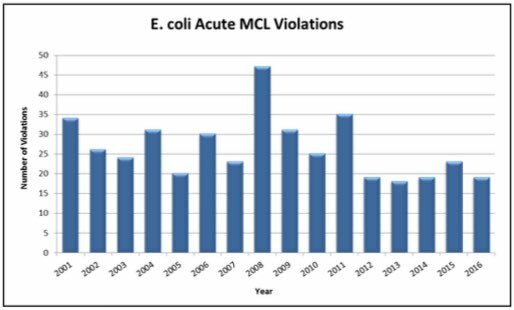 The number of violations for E. coli and acute MCL violations (maximum contaminant level violations – also mostly due to coliform contamination) peaked in 2008 and had another bad year is 2011. Since 2012, it has mostly been moving sideways. In 2016, there were 19 violations. In 2016, 38 public water systems had 3 or more “major monitoring violations” of the rules to protect against coliform contamination. That is an increase from 27 in 2013. Monitoring violations are a concern because hinders the Department of Natural Resources’s ability to determine if the drinking water is safe, especially if the monitoring violation occurs multiple times. In 2016, however, there were only 6 major “repeat monitoring violations,” down from 41 in 2013. A repeat monitoring violation occurs when If a routine sample from a public water system tests positive for coliform bacteria, then the system is required to submit a second test to confirm the finding, and to conduct follow up testing to ensure that the problem is eliminated. A repeat monitoring violation occurs when the system fails to submit the repeat testing or follow up testing. None of these violatios mean that people were actually sickened, the report does not address that issue. It does mean, however, that a potential vulnerability occurred, and that continuing work needs to be done to ensure that Missourians have safe drinking water. The next post will look into the nature of the violations that occurred. Missouri Census Data Center. Population Estimates for Missouri. Viewed online 6/28/2018 at http://mcdc.missouri.edu/trends/estimates.shtml. Missouri Department of Natural Resources. 2016. Annual Compliance Report of Missouri Public Water Systems. Downloaded 5/11/2018 from https://dnr.mo.gov/env/wpp/fyreports/index.html. By mogreenstats in Other Water, Water on 2018/07/12 .